Santa and Mrs. Claus address the crowd from his sleigh during last year's Parade of Lights in Napanee. Adam Bramburger photo. 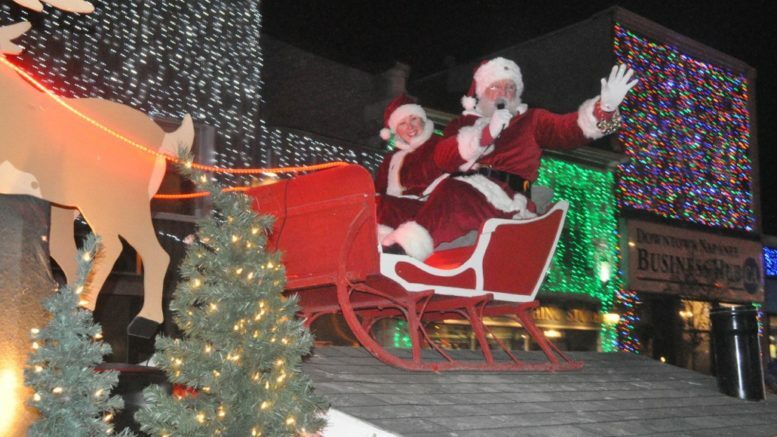 Santa Claus is coming to town this Saturday where he’ll once again anchor the Town of Greater Napanee’s Parade of Lights. Departing from Enviro Park Lane at 5:30 p.m., the parade will travel along Belleville Road before making a left on Dundas Street. It’ll then roll through Greater Napanee’s downtown core under the Big Bright Lights and then take a left onto Adelphi Street, left on Thomas Street, right onto Centre Street, left onto Graham Street W and then right onto West Street to return back to its starting point. As with previous years the parade is expected to feature big trucks, cars decked out in Christmas lights, horses, live music, creative floats of all shapes and sizes from local businesses and community groups, and of course the Jolly Old Elf himself at the very end, just to name a few. Floats or walking groups can register for the parade by contacting Bethany Chadwick at bchadwick@greaternapanee.com. The cost to enter the parade is a non-perishable food item which will be collected the night of the parade and given to the local food bank. “It’ll be between 70 and 80 (floats) by the time we get to Saturday, which is about what we normally get,” said Chadwick. Parade watchers who line the streets can also do a good deed and keep an eye out for the Salvation Army and Canada Post float. “Along the route there will be people collecting food donations, boots for the boot drive and letters to Santa,” said Chadwick. Leading up to the parade, the town is asking that motorists refrain from parking along the route.